We recently got a question from a mother whose daughter had a choking episode and is refusing to eat. You are right not to wait three months! Most children in this situation don’t need inpatient or intensive Eating Disorder treatment, but things can get worse quickly. This is not an uncommon event, but scary all around. EARLY support leads to best the outcome. Your doctor isn’t too worried, but you are seeing a dramatic difference and your gut says you need help. The phobia can become more entrenched the longer it goes on. (See case study below we wrote for doctors on Medscape for more. Part of why we are sharing this is for parents to have it to show to the child’s doctor if they need help finding resources, or having concerns taken seriously.) This is a traumatic event, and can take time to heal, but you should see steady progress with support. Find a therapist who specializes in children with anxiety and phobias ASAP. Briefly explain the situation, see if you can get a crisis appointment, at least within the next week or so if she truly is only drinking Pediasure and things are getting worse. Sometimes a call from your pediatrician can get you in sooner. Ideally the therapist has experience with “phagophobia” (with children who have choked and stopped eating solids), or with vomiting phobia. Cognitive behavioral therapies seem helpful in challenging the thinking process behind the fears. There are a few case studies of hypnosis as well that seem promising. A therapist with “somatic” training may be helpful as well since she is young. This is also called an “embodied” therapy, which helps regulate the physical experiences of anxiety after a traumatic event. Support nutrition with textures she can take in. Is she taking purees at all? Smoothies? Smoothie pops? Continue with Pediasure. If you can, make nutritious (protein and fat included) smoothies with foods she used to eat, or fruit/smoothie popsicles (think coconut milk, whole fat Greek yogurts, fruit, honey, bananas, nut butters… look online for nutrition boosting pop recipes). Reduce anxiety. Try to remain and project a calm, nurturing presence to help reduce her anxiety. Optimize “sleep” hygiene so she gets good rest. Try to help her continue to play with friends and participate in activities that get her mind off her fears. Continue to eat together, and she can join in mealtimes with liquids/foods she can handle. 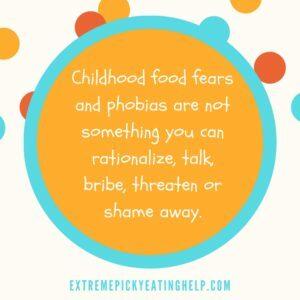 We think our book Helping Your Child with Extreme Picky Eating is particularly helpful around anxiety. We describe this “aversive” experience as a contributing factor to not eating. In general, unless there was a history of difficulty eating and swallowing, or there are any new factors or red flags, swallowing studies are not indicated. Waiting weeks to “rule out” swallowing difficulties can waste time for getting help. If you do pursue swallowing eval, don’t miss out on the other opportunities to help in the meantime. Get support if you have more questions. Mealtime Hostage has a wonderful private parent facebook support group. There will likely be other parents with kids who have experienced this. It could prove helpful, and give you ideas and local resources. *Note, while not likely causing the fear in this case, a sudden fear of eating or choking without an inciting event could be due to a strep infection which can trigger an OCD-like response and fear of eating/choking/food contamination (PANDAS). Medscape case study from two-part series. Courtney is a typically developing 8 year-old with an unremarkable history other than typical separation anxiety as a toddler and occasional nightmares. Mom brings Courtney in today as a walk-in. One month ago she was eating her favorite chicken fettuccine and choked on a piece of chicken. Mom performed the Heimlich maneuver and the episode lasted for less than 10 seconds, after which she vomited. Since then, Courtney is refusing to eat solid foods, she is having difficulty sleeping and her school work is suffering. Recently, she has gone from eating mashed or pureed foods to only drinking liquids. Mom is making smoothies which Courtney sips throughout the day. Mom noticed that Courtney appears to have lost weight. Mom has been on medications in the past for generalized anxiety disorder. Courtney is down three pounds from her last visit six months ago, dropping from 75th to 50th% in weight. Her exam is unremarkable other than that she appears anxious. No indication of dehydration. What are the appropriate next steps? Refer Courtney and her mom urgently to therapist skilled in treating anxiety and aversive events. Reassure mom and Courtney that her exam is normal, and she is unlikely to choke again. Follow up with mom by phone in 48 hours. Refer to more intensive treatment if her weight loss and intake does not stabilize over the next few weeks. As with other feeding and eating challenges, the evidence base for a ‘gold standard’ approach is missing. With this in mind, referral to a mental health provider with experience treating children with anxiety and phobia is the first step. Courtney was able to see an experienced psychologist. She and her parents identified safe foods which she was able to eat. Her sleep rapidly improved and weight loss stabilized. After three weekly sessions, including CBT exercises at home and relaxation techniques, she was gaining weight and able to eat increasingly challenging foods.